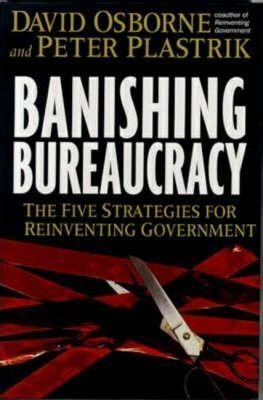 David Osborne's 1992 bestseller, "Reinventing Government," was a landmark book that identified ten principles for creating a more efficient government. This essential sequel goes one step further, focusing on strategic levers for changing public systems and organizations on a permanent basis to achieve dynamic increases in effectiveness, efficiency, adaptability, and capacity to innovate. In an age of disillusionment with public service, "Banishing Bureaucracy" offers inspiring stories of organizations that really work and provides specific recipes for effective change. Here is a road map by which reinventors can actually make "reinvention" work. Introduction: Uphill Battle, USA; Finding Your Leverage; The Five Cs: Changing Governments DNA; Levels of the Game: Targeting Strategies; Gut Check: What It Takes to Use the Strategies; The Five Strategies; The Core Strategy: Creating Clarity of Purpose; The Consequence Strategy: Creating Consequences for Performance; The Customer Strategy: Putting the Customer in the Drivers Seat; The Control Strategy: Shifting Control Away from the Top and Center; The Culture Strategy: Creating an Entrepreneurial Culture; Using The Strategies; Aligning the Strategies; The Courage to Reinvent.